Although it’s expected these days, Army of Two was designed for co-op play. You play as two best buddies, Rios and Salem, who are private contractors hired by the American military to exterminate power hungry military corporations. These two mercenaries are so hard that they can stomach a friendly fist pound after slaughtering hundreds of soldiers. Story-wise there doesn’t seem to be anything compelling; to me it felt like you were just gunning down terrorist after terrorist with a few tougher ones thrown in for good measure. But in some pretty nice places. 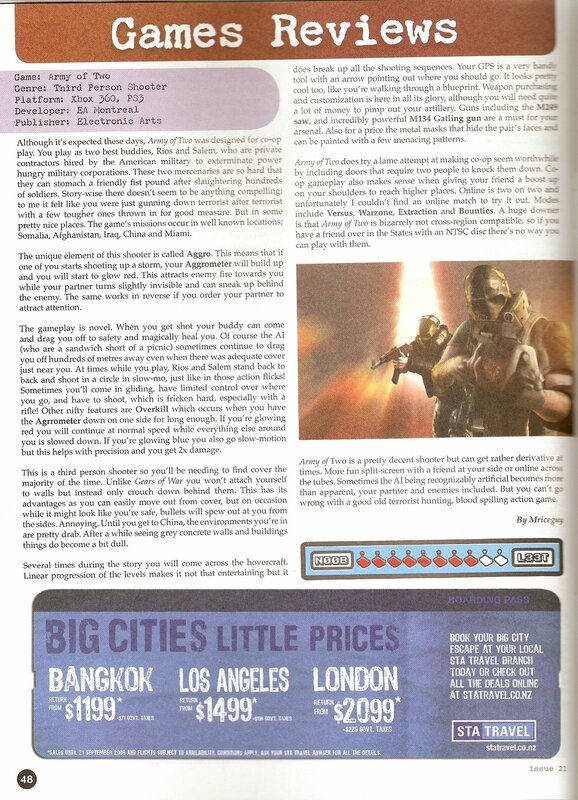 The game’s missions occur in well known locations; Somalia, Afghanistan, Iraq, China and Miami. The unique element of this shooter is called Aggro. This means that if one of you starts shooting up a storm, your Aggrometer will build up and you will start to glow red. This attracts enemy fire towards you while your partner turns slightly invisible and can sneak up behind the enemy. The same works in reverse if you order your partner to attract attention. The gameplay is novel. When you get shot your buddy can come and drag you off to safety and magically heal you. Of course the AI (who are a sandwich short of a picnic) sometimes continue to drag you off hundreds of metres away even when there was adequate cover just near you. At times while you play, Rios and Salem stand back to back and shoot in a circle in slow-mo, just like in those action flicks! Sometimes you’ll come in gliding, have limited control over where you go, and have to shoot, which is fricken hard, especially with a rifle! Other nifty features are Overkill which occurs when you have the Agrrometer down on one side for long enough. If you’re glowing red you will continue at normal speed while everything else around you is slowed down. If you’re glowing blue you also go slow-motion but this helps with precision and you get 2x damage. This is a third person shooter so you’ll be needing to find cover the majority of the time. Unlike Gears of War you won’t attach yourself to walls but instead only crouch down behind them. This has its advantages as you can easily move out from cover, but on occasion while it might look like you’re safe, bullets will spew out at you from the sides. Annoying. Until you get to China, the environments you’re in are pretty drab. After a while seeing grey concrete walls and buildings things do become a bit dull. Several times during the story you will come across the hovercraft. Linear progression of the levels makes it not that entertaining but it does break up all the shooting sequences. Your GPS is a very handy tool with an arrow pointing out where you should go. It looks pretty cool too, like you’re walking through a blueprint. Weapon purchasing and customization is here in all its glory, although you will need quite a lot of money to pimp out your artillery. Guns including the M249 saw, and incredibly powerful M134 Gatling gun are a must for your arsenal. Also for a price the metal masks that hide the pair’s faces and can be painted with a few menacing patterns. Army of Two does try a lame attempt at making co-op seem worthwhile by including doors that require two people to knock them down. Coop gameplay also makes sense when giving your friend a boost up on your shoulders to reach higher places. Online is two on two and unfortunately I couldn’t find an online match to try it out. Modes include Versus, Warzone, Extraction and Bounties. A huge downer is that Army of Two is bizarrely not cross-region compatible, so if you have a friend over in the States with an NTSC disc there’s no way you can play with them. Army of Two is a pretty decent shooter but can get rather derivative at times. More fun split-screen with a friend at your side or online across the tubes. Sometimes the AI being recognizably artificial becomes more than apparent, your partner and enemies included. But you can’t go wrong with a good old terrorist hunting, blood spilling action game. 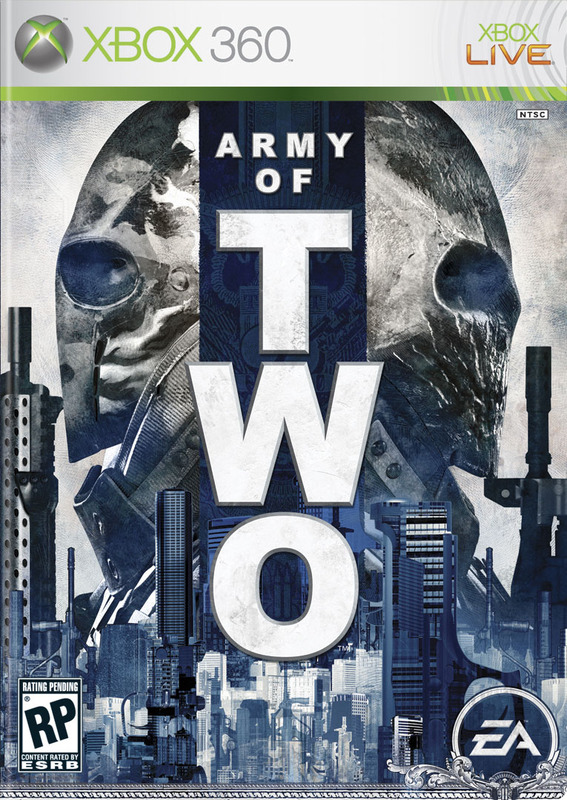 By the way the last issue of Salient has been published, so Army of Two is my last review for this year. However I may write a few reviews just for this blog before hopefully writing for Salient again next year.